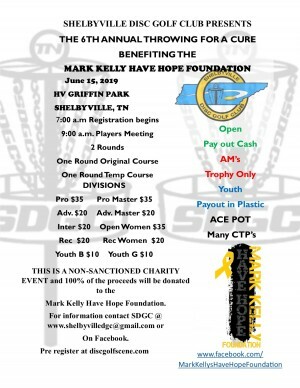 This is the 6th annual Throw for a Cure Disc Golf Tournament. This is a NON-SANCTIONED Trophy Only event and 100 % of the proceeds will be donated to the Mark Kelly Have Hope Foundation. Shelbyville Disc Golf Club is responsible for all refunds/cancelations.